Prominent & Leading Manufacturer from Roorkee, we offer flame proof torch, flame proof safety torches, explosion flame proof torch, viribus flame proof and torch and flame proof torches. 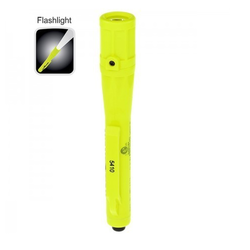 XPP-5412G Intrinsically Safe Penlight This 3AAAA penlight is cETLus, ATEX and IECEx listed Intrinsically Safe. It is ultra-compact and super slim with a powerful light output designed to illuminate very tight spaces. The tail-cap switch provides momentary or constant-on functionality. Power comes from 3 AAAA batteries (included). 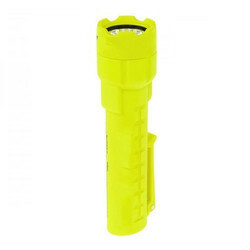 XPP-5420G Intrinsically Safe Permissible Flashlight This flashlight is cETLus, ATEX, IECEx, INMETRO and MSHA listed Intrinsically Safe Permissible. 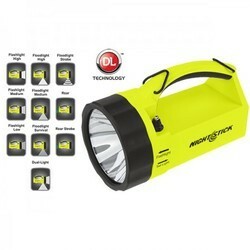 It uses a CREE® LED rated at 140 lumens that works in conjunction with a high-efficiency deep parabolic reflector to create a usable flashlight beam rated at 180 meters. The single body switch provides momentary or constant-on functionality. Power comes from 3 AA batteries (not included). XPR-5580G VIRIBUS™ Intrinsically Safe Dual-Light™ Lantern - Rechargeable The VIRIBUS™ Intrinsically Safe Dual-Light™ Lantern is a Flashlight, a Floodlight and a Dual-Light that is cULus, ATEX, and IECEx certified intrinsically safe. The flashlight setting offers 3 user-selectable brightness settings of 210, 100 and 30 lumens with a 635 meter beam distance. The flashlight beam is perfect for cutting through smoke and lighting up objects at great distances. The floodlight setting has 3 user-selectable brightness settings of 200, 100 and a “Survival Mode” of 30 lumens that provides just enough light in an emergency situation with a run-time of 65 hrs. The Dual-Light mode allows the user to simultaneously see objects at a distance, as well as, see the ground in front of them as they walk or work. The 5580 is powered by a single rechargeable Lithium-ion battery. 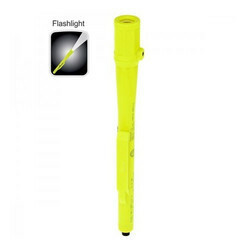 All flashlights are cETLus, ATEX, IECEx, INMETRO and MSHA listed Intrinsically Safe Permissible UL listed. We obligated to meet the quality standards as per the customer demand.